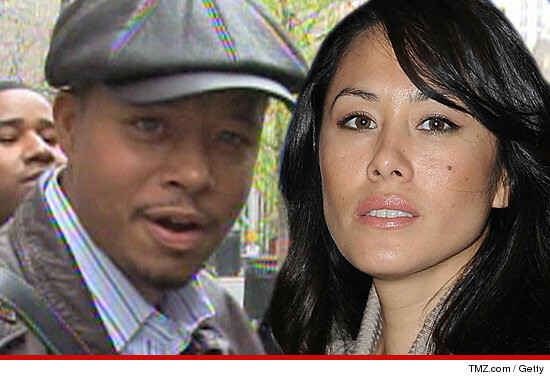 Terrence Howard flew into a violent rage -- throwing his then-estranged wife to the ground, and threatening to slash his own wrists -- after she accused him of cheating ... this according to documents filed by Howard's ex. In the court docs, Michelle Ghent claims the brawl went down in a Toronto hotel room in April ... when she found phone numbers for 6 women in his bag ... and promptly called the women while Howard was in the room. In her filing ... Michelle says the 44-year-old Oscar nominee threw her computer out a window, lifted her off the ground and slammed her down ... and reached for an X-Acto blade and put it to his wrist. Ghent claims Howard also pretended to hang himself with a belt -- and told her, "I'm just thinking if I should kill you first before killing me." Two days after the hotel fight ... Ghent claims Howard continued talking about suicide in text messages. Her filing includes dozens of texts she claims he sent -- in one, Terrence allegedly said he wishes he "wasn't such a coward and that I had the courage to finish what should have been accomplished in the abortion clinic 44 years ago." In another text Howard allegedly said he was going to get outpatient treatment for "his addictions and emotional instability" -- and offered to deposit more than $25,000 in her account to cover the damage to her computer. As we previously reported ... Ghent got a temporary restraining order against Howard last month after he allegedly punched her and kicked her during a July vacation in Costa Rica. For his part, Howard claimed she had pepper sprayed him. Terrence and Michelle's divorce was finalized just 2 weeks after the alleged Toronto brawl.